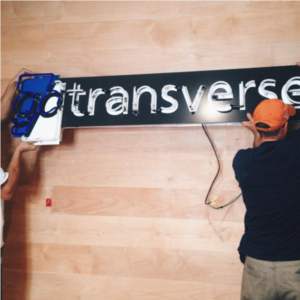 Recently at Gotransverse we have been able to move in to our fun and exciting new office space downstairs, still located in our cool and historical "home base" right at the intersection of 7th and Congress in the heart of Downtown Austin. It's a great feeling with some conflicting emotions. In some ways it feels like a great accomplishment and reaching a milestone of months and months of planning and consultation from every group within the company. Yet in other ways, it feels like the beginning of our next odyssey as we continue to grow. Formerly, we had a space on the 2nd and 3rd Floors of the Historic Samson Building here at 620 Congress. While it had a cool and eclectic feel, it lacked some of the features we felt would benefit a growing and collaborative company like the one we are. For instance, our former space had lots of small offices but limited space where co-workers were able to break out and meet over everything from intensive topics to simple brainstorming sessions. Our new space is full of great features that address those issues. To start, our new first floor space is directly on 7th Street and Congress and you can really feel the energy and vibe of Downtown Austin. It's a mix of old and new: a historic, old building, now with a big open space and beautiful wood floors so our team can see each other and collaborate. We have a gorgeous conference room for larger meetings and small breakout rooms for private, sensitive or smaller meetings. Our team is all about collaboration! All over the place, we have whiteboard paint so anyone can—literally—write on the walls and brainstorm on ideas. We have a large gathering room with a big "kitchen table" for company meetings or simply hanging out and having a bite to eat from our great, new kitchen where we serve company lunches three times a week. There is even a great basement space that serves as a lounge, where our hard-working geeks can recharge, collaborate and team-build. This is truly a time of change and opportunity at Gotransverse and our newly renovated space highlights the exciting future we have ahead! page to find out what opportunities we have available!